WEB EXCLUSIVE: Trexel, MuCell, debut new technologies for automotive lightweighting. Developmental automotive air duct was accumulator-head blow molded with Trexel’s MuCell microcellular foam process using direct gas injection. It offers weight savings and heat and sound insulation. Collaboration between Kortec and Sidel resulted in Kortec LB coinjection technology for molding three-layer PET preforms with a black layer in the center and white layers on both sides to provide complete UV protection to milk and other light-sensitive products. Foam blow molding re-emerged as a theme at this year’s K show. Trexel, Inc., Wilmington, Mass., showed off a developmental HDPE automotive air duct blow molded on an accumulator-head machine using Trexel’s MuCell process with direct gas injection into the machine barrel. The duct has 1.5-2 mm wall thickness and a 41% density reduction, resulting in a 32% net weight saving vs. a solid part. Trexel believes that optimized part design and material formulation could result in more than 40% weight reduction. Foam was found to yield additional benefits, such as improved thermal and acoustical insulation. Meanwhile, MuCell Extrusion LLC, Woburn, Mass., a company unconnected to Trexel that markets the MuCell process only for extrusion and blow molding, already has one Japanese customer, Kyoraku Co., Ltd., Tokyo, that has blow molded microcellular HDPE auto ducts for several years. It claims 50% weight reduction and 3.5 db noise reduction vs. conventional solid ducts with PUR foam sound insulation. 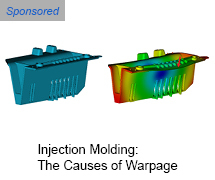 Kyoraku offers to help other companies implement MuCell blow molding. MuCell Extrusion also reports that several makers of personal-care packaging are interested in blowing foamed bottles for material savings and improved sustainability. 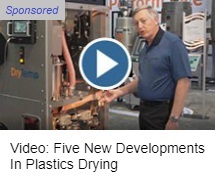 Other blow molding news includes the ability to produce PET bottles for milk and other light-sensitive products with 100% light-blocking ability to protect nutrients from UV degradation. The bottles are made with multi-layer preform coinjection technology from Kortec, Inc., Rowley, Mass., in cooperation with Sidel Inc., Norcross, Ga. New Kortec LB technology molds three-layer preforms with white PET on the outside, black PET in the middle, and white PET on the inside. 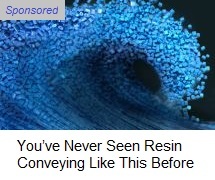 This approach reportedly ensures that the black light-blocking layer covers the whole of the bottle, including the base, allowing no light entry. A three-position valve pin in the Kortec nozzle closes off the black layer before the end of injection so that it is completely encapsulated. Over a year of work was needed to optimize the amount of colorant used for maximum cost-effectiveness. Some carbon black is saved by not filling the black layer into all of the neck area, since some is covered by the cap. Kortec LB technology is available for up to 128 cavities. A 1-liter preform currently weighs 25 g, though 22 g preforms are in development.